Savage 10/110 BA Stealth Law Enforcement Series is designed to meet the needs of law enforcement officials and professional precision shooters alike. When it comes to long range, accuracy is of the utmost importance. This Savage ba stealth will certainly get the job done with more than enough accuracy. The only cons that I can think of when talkin about the stealth is inside the receiver the finish isn't the greatest. The barrel profile is nice and not too heavy while still proving to be accurate over long strings of fire. The chassis is nice but could be improved upon with a KRG in my opinion. Trigger is excellent and safe, which is important. Shoots sub-moa groups with factory ammo. Great price. The bolt works a little hard at first. IS PRECISION AND THE TRIGGER ISTHE BEST TRIGGER ON THE MARKET!! 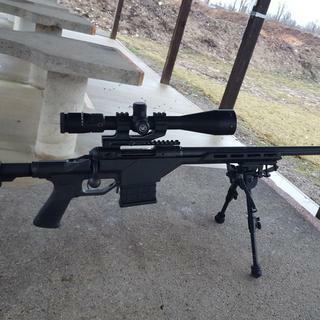 Awesome savage rifle in 6.5 creedmoor. Love this rifle very accurate. Less than 2 inches at 300 yards. Great. Better trigger and stock adjustments than the Ruger PR. Put 5 shots on paper @ 100 yards with all 5 bullet holes touching. This rifle is a tac driver. My only other Savage rifle is a .308 FCP (20"). It definitely was not sub-MOA out of the box. Eventually worked it up to 0.5 MOA with 168 SMK, but it took a while (and it seems damn picky about the bullets it likes). On the other hand, with 6.5 CM Stealth, I put 15 break-in rounds through it and then started to see how well it would group. Using 130 TMK (38.2 grains Varget), I shot repeated 3-round groups just under .5 MOA. And honestly, I'm not the best shot in the world. Not sure if this is the 6.5 CM being inherently more accurate than the .308 or if Savage just puts more quality control into their Stealth line. The main negative I have about this rifle is the stock. The plastic adjustable cheek rest did not give good cheek weld. Had to immediately replace it. Also, the magazine seems kind of cheap and is not feeding very reliably out of the box. Seems like Savage did a great job on the guts of the rifle, but cut corners on stock and magazine. Savage 10/110 BA Stealth Rifle in 6.5 Creedmoor. This rifle begins it's life as a factory blue printed Savage Action which is then paired with a carbon steel barrel. Next the action and barrel are carefully placed into a precision machined Monolithic solid billet aluminum chassis for the ultimate in free floating accuracy. Additionally the forend features the Magpul M-LOK compatible accessory attachment system which allows for any of your M-LOK compatible accessories to be attached. Moreover the Savage Arms 10/110 BA Stealth features a picatinny optics accessory rail, Savage AccuTrigger, pistol grip and AR style buttstock.